New $0.50/1 Fresh Express and B1G1 FREE Sale! 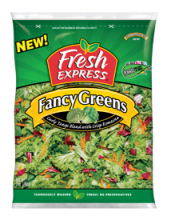 There is a new coupon available for $0.50/1 Fresh Express Salad Mix for you to print. Grab it while it’s still available. I’ve told you a gazillion times, coupons for fresh produce go very fast! There is also a great sale this week at Target. Fresh Express is on sale B1G1 Free! They are priced at $2.99, so if your store will allow you to use two coupons, your final price will be $1.99 for both! One of the most asked questions is how to save on produce and fresh goods. Well, here’s a great coupon that makes that possible. Head over to Facebook and “Like” Fresh Express. They’ll give you a $1 off coupon for one package of Fresh Express Salad Mix.